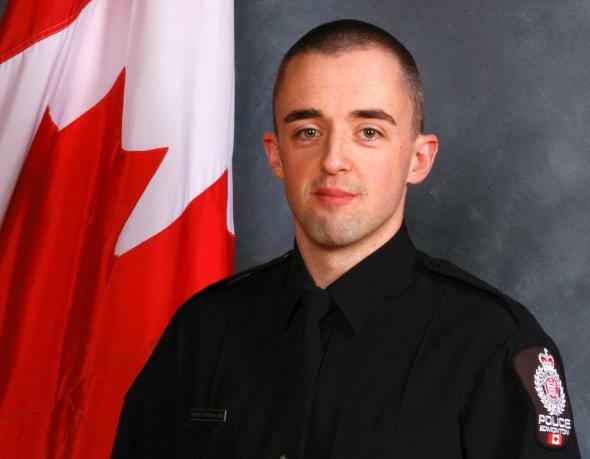 Edmonton police officer killed: Reportedly first to die on duty in more than two decades. Daniel Woodall, 35, was killed Monday night in Edmonton. Officers approaching a suburban Edmonton home on Monday night to serve a criminal harassment warrant met a barrage of sudden and intense gunfire, leaving one officer dead, another injured, and several others pinned in place by gunfire for at least 10 minutes. The victim of the shooting was Const. Daniel Woodall, a 35-year-old officer with the hate crimes unit, and the father of two young boys. In the comparably sized United States city of Jacksonville, 12 officers have died in the line of duty since 1990—some from heart attacks and auto accidents, but others from gunfire and vehicular assaults. The city of Toronto lists 40 names on a memorial page for fallen officers; Chicago—which, like Toronto, has a population of over 2.5 million—lists 526.